Fancy promoting your company brand name with a gentry image and professional look? If you found this page - you have style and good taste. Our beautiful customised windowed round 4.5oz Hip Flask for Company Gift will shine in the light with your corporate brand name and logo with full exposure on its engraved surface. The front window allows an inspection of the beverage inside and looks slick. 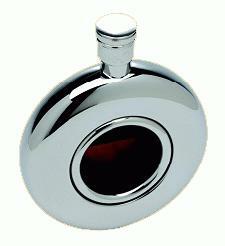 Traditionally the small compact Hip flask was used by the noble and started to appear in the 18th century. Gin would traditionally be smuggled onto British warships via makeshift flasks created from pig's bladders. In the early 19th century the hip flask was a personal favourite during the American prohibition in the 1920's and selling a hip flask in the state of Indiana was consequently banned. Ideal for storing alcoholic drinks such liquor, whisky, and other drinks, this gentry item is an ideal promotional gift to expose your company name over years of time as a personal favourite to be treasured. Hand out at trade fairs and business conventions, this makes a generous good will promotional gift, or an ideal retirement hip flask to say thankyou. Customers and clients will be most grateful of your goodwill and will return with good business.